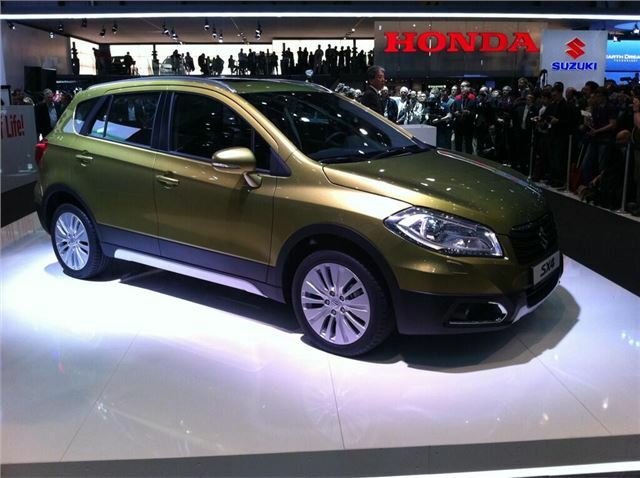 The new Suzuki SX4 has been given its European launch at the Geneva Motor Show. The compact SUV is now in its second generation, and has been grown by its engineers to meet the demands of European buyers. It's appreciably longer than the outgoing model at 4300mm in length, which also puts it half a class above new compact crossover cars such as the Ford Ecosport, Peugeot 2008 and Renault Captur. Suzuki confirms that the SX4 (or S-cross-4 in PR speak) has moved into the C-sector, although really it sits between the Ecosport and Kuga in size - and probably appeals to a move off-road-oriented crowd. Suzuki says that it created the new SX4 Crossover by uniting its small-car know how with SUV thinking, and looks like it has also delivered a larger cabin in the process. It's offered with a choice of either a 1.6-litre petrol and 1.6-litre diesel engine, and the latter comes with a five-speed manual transmission as standard but there is the option of continuously variable transmission (CVT) transmission. The 1.6-litre petrol version can be specified with two- or four-wheel drive, with the former delivering 125g/km of CO2 with either transmission. In 4WD, that figure rises to 136g/km. The 1.6-litre diesel has a six-speed gearbox and its CO2 figure drops to 110g/km with stop-start. The SX4 will be built at the Magyar Suzuki plant in Hungary, and goes on sale in the autumn.Suzuki says that the launch of the SX4 marks the start of an expansion programme, with more models being exported to more countries. Prices and on-sale dates will be revealed in the coming months.